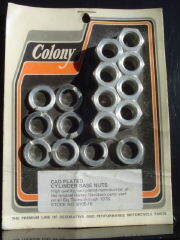 High quality plated reproduction of the original cylinder base nuts used on all Big Twins through 1978. Replaces OEM #'s 7055, 7839, 7039 & 16602-30. Colony Stock #'s 8104-16 &8105-16.